Your logo will be prominently displayed on the official STC Summit tote bag. Sponsorship also includes your logo prominently displayed on various conference marketing, including the on-site brochure, a link from the STC conference website to your website, and a complimentary insert in the tote bag. Your company name will be prominently displayed and worn by every attendee throughout the conference. Sponsorship also includes your logo prominently displayed on various conference marketing, including the on-site brochure, a link from the STC conference website to your website, and a complimentary insert in the tote bag. With all the exhibitors attending the STC Summit, it can be hard to decide which exhibits to see first. Email addresses of pre-registrants are not made available for marketing purposes, but STC staff will send your email for you. This is a fabulous opportunity to get your product message delivered right to the inbox of attendees. Want to drive traffic directly to your booth? You have the opportunity to guarantee your company’s exposure to attendees and improve networking opportunities by sponsoring the opening night Welcome Reception. Just about every conference attendee will take part in this event. STC will strategically place a buffet table near your exhibit space so everyone will be able to thank you for the delicious food. Sponsorship includes tent cards for buffet tables, large sign at entrance, and optional logo napkins (to be provided by sponsor). There will be at least four refreshment breaks served in the exhibit hall, including coffee in the mornings and coffee or a cold beverage in the afternoon. Your company can have its name attached to one or all of them. You may also display napkins with your company logo on each table if you desire (at your expense). Sponsor the #1 networking event of the Summit. Speed Networking is a 45 minute, fast-paced event experience in which attendees participate in several rounds of networking at multiple tables and takes place twice during the Summit. Sponsor one event and your company will receive its logo on all marketing signage and messaging about the event. You may place your company’s information at each table, pick your own emcee to start and close the event, and receive three registrations for your employees to participate. Individual sponsor registrations are also available. Be one of the select few to have your corporate informational piece (not to exceed 8.5” x 11”) inserted into all attendee bags distributed at registration. This is your opportunity to present a sponsored education session (non-marketing/sales) as part of the regular programming with a speaker of your choice (topic and subject to be approved by the program advisory committee). Your company will be recognized with a sign posted at the session and also noted in the program. Help conference attendees stay connected and keep up to the minute with annual meeting events. Wireless service provides attendees access to the internet and email throughout the meeting rooms. Information about your company will be the default screen on the computers of all attendees utilizing wireless internet during the conference. 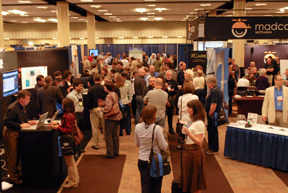 Showcase your company’s products and services to conference attendees. Different from a Sponsored Education Session, present your 60-minute session in a draped, more casual, theater-style setting in the exhibit hall. The schedule and details of these presentations are included among the education session listings in the conference program. Have an idea that’s a little outside the box or want to package a few opportunities together? We can work together to build a custom opportunity that’s just right for you! Contact Maura Paoletti, National Sales Manager, The Walchli Tauber Group, at +1 (443) 512-899, ext. 110, or maura.paoletti@wt-group.com to discuss.